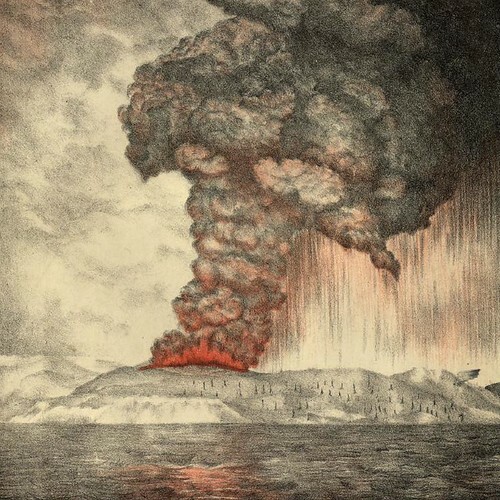 It was 10:02 a.m. local time when the sound emerged from the island of Krakatoa, which sits between Java and Sumatra in Indonesia. It was heard 1,300 miles away in the Andaman and Nicobar islands (“extraordinary sounds were heard, as of guns firing”); 2,000 miles away in New Guinea and Western Australia (“a series of loud reports, resembling those of artillery in a north-westerly direction”); and even 3,000 miles away in the Indian Ocean island of Rodrigues, near Mauritius (“coming from the eastward, like the distant roar of heavy guns.”). In all, it was heard by people in over 50 different geographical locations, together spanning an area covering a thirteenth of the globe. 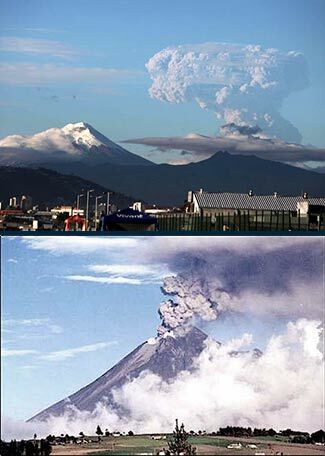 As we Bring the Noise, we might that it was on this date in 2013 that the eruption of Ecuador’s Tungurahua volcano sent a massive plume of ash, stones, and vapor soaring more than eight miles into the sky above the Andes.